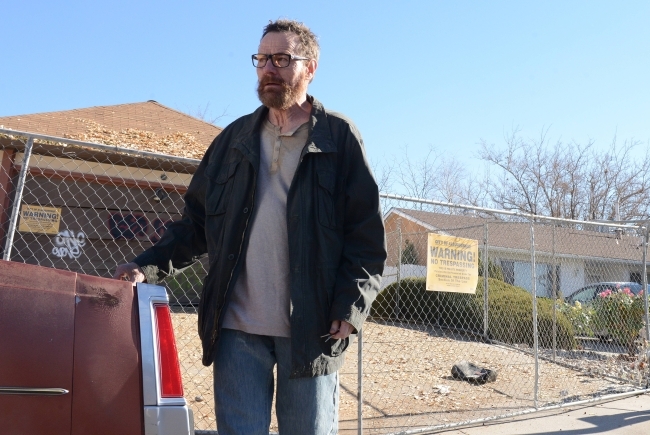 The Bard would close things happily for Albuquerque, which means horribly for Walt & co.
Three episodes remain of Breaking Bad, the riveting series on AMC that tracks the descent of Walter White, a high school chemistry teacher turned drug kingpin. The show has accurately been compared to a Shakespearean tragedy, and it's clear that the Bard's works have influenced Vince Gilligan, the show's creator. Perhaps, then, one might turn to the works of Shakespeare to try and divine how Breaking Bad might end—or at least, how Shakespeare would end it. Let us first establish that the tragic hero in Breaking Bad is Albuquerque, New Mexico. Because of Walt's actions, the city has attracted ax-wielding twin psychopaths, sustained an airliner collision, suffered a dead and "disincorporated" child, and has been littered with innumerable ancillary bodies from the merciless drug trade. This is to say nothing of Walt's pure and highly addictive blue crystal methamphetamine and the ruined lives of countless addicts and their families. Albuquerque is a city under siege. Shakespeare crafted similar such cities and states. The tragic hero in Hamlet is Denmark. By the play's end, however, where previously there was "something rotten," Denmark is now restored. The extent to which the board is reset becomes apparent when you consider the body count and who remains. Among the dead: Claudius, the most rotten of them all; Gertrude, who has something of dubious virtue; Laertes, whose moment of weakness dooms him; Polonius, whose nosiness is his undoing; and, of course, Hamlet, whose inaction led to the events in the first place. (Caught in the crossfire is poor Ophelia.) But when these characters are gone and the able Fortinbras steps in, Denmark's "unweeded garden" is saved. In Romeo and Juliet, Verona is not a place in which you would want to raise your family. The Capulets and Montagues have left the city in total dysfunction. Indeed, the tragic hero in the play is the city. Consider that the final curtain doesn't fall with the death of Juliet, which would seem like the obvious stopping point. Instead, the focus of the play then shifts to Verona itself. Through the deaths of Romeo and Juliet, the city is healed. The title characters were simply instruments of some higher purpose. Romeo and Juliet is especially comparable to Breaking Bad in that both works could have ended at almost any time and still have had reasonably happy endings. How many times could Walt have retired from the meth business? The day his daughter was born would have been the most obvious start for a new, clean, well-funded life. But his pride forced him back into the lab. Later, he could have let Gus Fring's death set him free. Obviously, he didn't. Shakespeare wrote, "There is special providence in the fall of a sparrow," and if that is the case, what does it say about human beings, the paragon of animals? In Shakespeare's works, each of us has a certain destiny. We can try to thwart it or challenge it, but ultimately we must align ourselves with it. The consequences of doing otherwise depend on the world in question. If the world is benign, you get slapped around a bit and fall in line. If the world has a malignity or malice toward you, you're going to get slapped around and die. What can you do about it? Nothing. In either case, once Shakespeare's characters discover who they really are, the world harmonizes; it falls into place. All of this is part of the "great chain of being," an idea from the Middle Ages that found new life during the Renaissance and remained resonant through Shakespere's time. According to the concept, everything has a place in the universe. From the top down, you move from God to angels to cherubs and to human world. In the corporeal realm, kings are anointed as the highest creature, followed by aristocrats, the clergy, landed gentry, and the peasant cast. Women rank lower than men; rocks are lower than plants. And so on. Regardless of whether you are a peasant or an aristocrat or a king, where you are born is where you stay. Problems occur when someone tries to step outside of, or reject, the order in the universe. The great chain of being will demand a correction. Walt threw the universe out of joint the moment he stripped to his underwear and cooked a batch of meth with Jesse. When he rejected his place in society (that of a humble schoolteacher) he destabilized the world around him. He became the dark star around which those who orbited were depleted of innocence. Skyler grew to accept Walt's business and embrace his money. Later, she encouraged him to kill Jesse, who Walt considers to be "family." Hank, who was an early and unexpected moral compass, gladly put Jesse out as bait, knowing that Walt might murder him (i.e. Jesse). Gomez stood by Hank's side during that plan. For his part, Jesse, while angst-ridden and drug addled, still shot an unarmed (and harmless) man in the head, on top of a list of crimes to make Macbeth wince. (Just because you feel guilty while bearing witness to the chemical disintegration of a child doesn't absolve you of guilt.) Alas, Albuquerque. Many have compared Breaking Bad with Macbeth, a fact brought home by Skyler's recent turn as a mild variant of Lady Macbeth. The play's title character hoped that Duncan, the king, would overstep Malcolm, the prince. In accordance with the great chain of being, however, that's never done. Macbeth's problem, therefore, is beyond ego; his problem is with the whole universe. One might similarly describe Walt and his fixation on Gray Matter, the company he co-founded but cashed out of before it went public. The parallels between Walt and Macbeth are many and obvious. Consider the descent of the character Macbeth. At the play's open, he has slain the rebels. It's a heroic action and preserves Scotland for posterity. Then, in his ambition, Macbeth murders Duncan. This isn't an OK thing, but killing a king to assume the throne has some precedent in the Middle Ages. The justifications become more tortured as the play continues. The ordered killing of Banquo, his best friend, is unjustifiable, but at least Banquo is a knight and a man. There is no forgiving the murder of Macduff's family, however. Macbeth is, by then, utterly without remorse, and here we have a man who has fallen from the pinnacle of heroics to the lowest depths imaginable. Walt's body count is no less impressive, and his fall no less severe. He kills Emilio and Krazy 8 in self-defense. (On one side of his pros and cons list: "MURDER IS WRONG!" On the other: "He'll kill your entire family if you let him go.") Through his willful inaction, he kills Jane, Jesse's girlfriend. He plows his van into two drug dealers who are confronting Jesse, shooting one of them in the head. At least in the case of his third, fourth, and fifth slayings, he has Jesse's interests at heart. Things get easier for Walt as the show progresses. When Gale, Gus, and the prison inmates are killed, it's only out of Walt's self-interest that they die. Indeed, by the time Walt is ordering the deaths of prison inmates, the act is clinical—lives reduced to loose ends that need to be tied. Only once does Walt kill for no reason but his passion. He shoots Mike, basically, because Mike was mean to him. It's notable that in the aftermath, Walt seems to lose his taste for blood, but there's no measuring how far he's fallen. Like Macbeth, Walt sets aside his basic humanity when he poisons Brock, and later, visits Brock and Andrea at home as an intimidation tactic against Jesse. Once you're rummaging through your flower garden for just the right poison to use on a child, you're officially evil. The question, then, is how would William Shakespeare end Breaking Bad? Picking up where last Sunday's episode ended, Hank and Gomez are unlikely to survive the shootout with the Nazis. To an extent, they've been corrupted by Walt, who is himself an aberration in the great chain of being. Likewise Jesse, who might survive the shootout, but wouldn't survive Shakespeare's final scene. Skyler attempted to kill herself once. And though she's certainly darkened, like Lady Macbeth, perhaps through a completed suicide she will reveal her redeeming spark of humanity. The Nazis have already erased Declan's gang. Once Lydia is dead, Blue Sky's last conduit to Eastern Europe will disappear. Todd and the Nazis will not survive Walt's M60 machine gun. As for Walt, it's inconceivable that Shakespeare would let him survive to see the curtain drop. With the deaths of each of these characters, the great chain of being will have been entirely corrected, and Albuquerque restored. Walt's barrels of money will remain buried in the desert forever, lost, as though the bills had never been printed. Walt's Blue Sky recipe will disappear from the world. To a certain extent, it will be like the series never happened at all. Marie, a widow, will take in Walter Jr. and Holly, leaving them well cared for after Walt's death. This is a kind of happy ending in itself; a good life for his kids was the prime motivator for Walt's first cook with Jesse. The only lingering question is how Walter uses the ricin. Not even Shakespeare can tell us that one.